Cyrus and I are in the middle of closing on our first house in Evergreen, CO–a mountain home! I thought it would be nice to make a special dinner to celebrate. We made it to the next step in the process–time for the appraisal next week (crossing our fingers!). Last night I prepared the pumpkin custard and refrigerated it for 24 hours, so it is sure to be cold enough to firm up to the perfect ice cream texture in just less than 20 minutes. I also made homemade waffle cones with of my pizzelle iron ahead of time. If you’ve never had this beautiful Italian flattened out thin and crunchy cookie, make a point to find them at the grocery store or better yet go out and buy a pizzelle maker like I did after I fell in love with my first homemade pizzelle. I believe I always see these cookies for sale at Whole Foods. Sorry I forgot to get pics of mine in the making, but you will see it as a bowl shape in the final ice cream picture below. In addition to the usual flat ones, I made cone and bowl shaped pizzelles specially for the ice cream. 1 Tbs. spiced rumIn a bowl, whisk together the pumpkin puree and vanilla. Cover and refrigerate until cold. Remove the cream mixture from the heat. Gradually whisk about 1/2 cup of the hot cream mixture into the egg mixture until smooth. Pour the egg mixture back into the pan. Cook over medium heat, stirring constantly with a wooden spoon and keeping the custard at a low simmer, until it is thick enough to coat the back of the spoon and leaves a clear trail when a finger is drawn through it, 5 – 6 minutes. Do not allow the custard to boil. Strain through a fine-mesh sieve into a bowl. Place the bowl in a larger bowl (ice bath), stirring occasionally until cool. Whisk the pumpkin mixture into the custard. Cover with plastic wrap, pressing it directly on the surface of the custard to prevent a skin from forming. Refrigerate until chilled, at least 3 hours or up to 24 hours. I like to make the night before, so I am not waiting and pressed for time. Transfer the custard to an ice cream maker and freeze according to the manufacturer’s instructions. Add the rum during the last minute of churning. 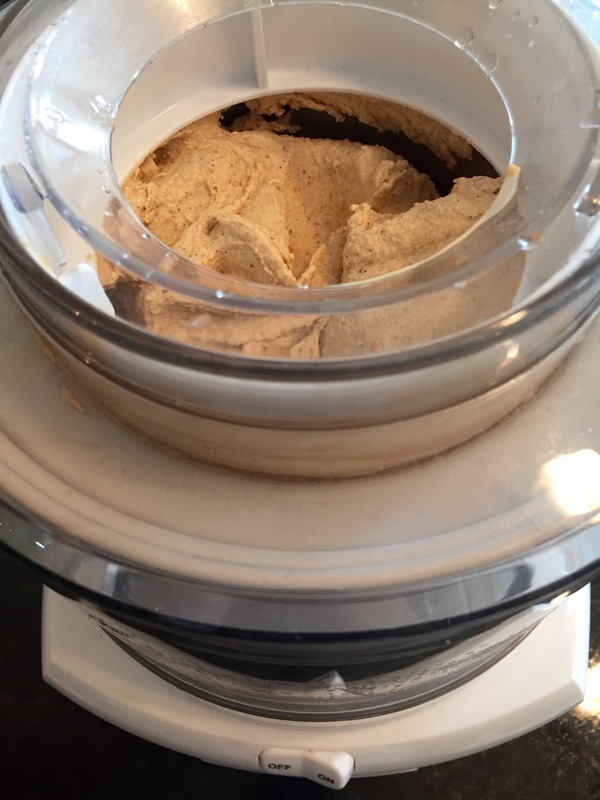 Transfer the ice cream to a freezer-safe container. For the enchiladas this evening I made homemade tortillas for the first time. They turned out to be the perfect texture, light and airy. Combine dry ingredients, then cut in the butter blending all until cornmeal like texture. Then add the water until moistened. Knead dough on lightly floured surface and shape into ball to place and rest in airtight container for 30-60 mins. Then shape into slender log and pinch off into 12-16 tortillas depending on size of tortillas preferred. When ready to cook, flatten out balls as thin as possible without tearing and watch them cook quickly on a cast iron skillet at medium heat. Watch and flip after 30-50 seconds to cook each side to look like pictures below (see cooked tortillas in bowl). After the tortillas were cooked, I made them into Veggie Enchiladas filled with caramelized carrots, sweet potatoes, quinoa, and onions topped with sour cream, tomatillo-cilantro, and homemade salsa trio of sauces. I also grated white cheddar and cotija cheese over the top. I cooked the enchiladas at 400 degrees until all was warm throughout and cheese was melted. I served guacamole and ranchero beans as sides. We barely saved room for the pumpkin ice cream with this big meal not the mention sharing a bomber of Buffalo Bill’s Black Pumpkin Oatmeal Stout. I roasted pecans with brown sugar and honey, then tossed them while warm with Heath bits and dark chocolate chunks making it into a crunchy crumble to sprinkle on top of the ice cream.